This picture is the property of Cat, Gaiman's assistant in SoCal. It is *not* covered under the CC license. I have no picture of Gaiman signing stuff because when I'm at CCI I have other things to do besides take pictures. I don't even take a camera to CCI. How he realized I was doing 'bunny ears' behind his head I figure has something to do with his Mojo. I thought I was being sneaky. On one hand, I hate this picture because I look weird. 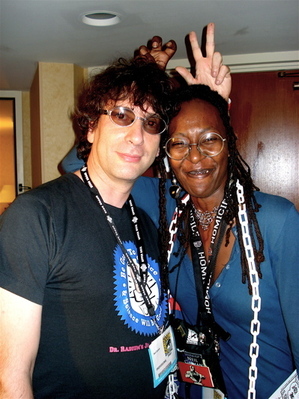 On the other, Gaiman's a nifty guy who has routinely put out astonishing work for going on maybe 20 years now, and this is the only picture I have of him and Me in the same place.